Reg Blow for reviewing the text prior to initial publication. The traditional owners of Uluru-Kata Tjuta National Park speak Pitjantjatjara and Yankunytjatjara and call themselves Anangu – “we, Aboriginal people.” Anangu lived in the deserts of Central Australia for tens of thousands of years before the arrival of white settlers, leading a nomadic hunting and gathering way of life rooted in a spiritual relationship with the land. Anangu believe that the world as it is today was created by heroic ancestral beings that roamed the land before humans existed. As these beings moved from place to place – meeting friends, fighting, having adventures, performing ceremonies – they shaped the landscape and left some of their spirit behind. Thus, the exploits of Anangu’s spiritual ancestors are mapped throughout the land in topographic features like waterholes, rock formations, caves, hills and gorges, and these features are regarded as sacred places. Iwara, the paths their ancestors created as they traveled the land, link these sacred places and are an important element of Anangu belief and culture, both as means of travel and social connection and as a spiritual link to the past and its stories. As Anangu travel the iwara, they recount ancestral tales in the form of song cycles that take days to sing. Uluru and Kata Tjuta are two important sacred centers, containing more than 40 named sites and countless other secret sites, and numerous iwara crisscross the area. Anangu call their creation period Tjukurpa, and this name also represents their way of life as a whole – their law, philosophy and religion; relationships among people, animals, plants and land formations; and the understanding of what these relationships mean and how they should be maintained. Tjukurpa shapes their system of morality, and the symbolic stories of Tjukurpa guide daily life, from land management to social relationships. Essential to the law of Tjukurpa is Anangu’s responsibility as caretakers of the natural environment. The knowledge of Tjukurpa is maintained and passed on through oral narratives, song cycles, ceremony and art, all of which are interconnected with the landscape. In the 19th century, British colonization began to disrupt the Australian indigenous way of life. Faced with Aboriginal resistance, colonizers forced many of the native people off their lands and into controlled settlements. Because of its limited commercial potential, much of Central Australia was designated as Aboriginal reserve territory and remained relatively unaffected by colonization until the early- to mid-20th century. But with the establishment of large pastoral homesteads and gold and mineral mining operations, business interest in the territory became significant. Uluru’s tourist appeal was realized as the region’s roads and infrastructure grew, and businesses waged a prolonged campaign to open the region to tourism. In 1959, the area of the reserve that included Uluru and Kata Tjuta – known then as Ayers Rock and Mount Olga by white settlers – was excised for use by tour companies, and Anangu were forced from the area. By the 1970s, Ayers Rock-Mount Olga was the most famous stop on the outback tourist circuit. Motels and shops had sprung up, and visitors were free to tramp through secret ceremonial sites and camp on top of the Ayers Rock, which Anangu do not climb because of its spiritual significance. Meanwhile, some Anangu had returned to the area and established a camp at the base of the rock, and in the face of the uncontrolled development, it became clear that they needed to reassert their traditional tie to the land in order to protect their sacred sites. In 1979, the Central Land Council (CNC) lodged a claim on behalf of Anangu under the Aboriginal Land Rights Act of 1976. The culmination of decades of indigenous struggle for land reform, this law set a benchmark as the first government act to legally recognize the Aboriginal system of land ownership, which is communal and inalienable. It designated all reserve land as Aboriginal-owned, and it enabled Aboriginal people to lay claim to unused government land or land to which they can prove traditional ownership. The claim for Uluru-Kata Tjuta, however, was deemed invalid because the area had been designated a National Park in 1977 and could only be returned to Anangu ownership if the Land Rights Act was amended. The CNC and traditional owners immediately launched a campaign to change the law, give the land title to Anangu, and establish the traditional owners as a majority on the park’s board of management. In 1983, the Australian government agreed to these requests; two years later, the title papers were signed over to Anangu, who in turn leased the park to Parks Australia under a joint management agreement. Significantly, the terms of the lease allow for its termination if the government enacts legislation that is detrimental to the interests of the park’s owners. It also allows tourists to climb to the top of the sacred rock. In 1995, in acknowledgement of Anangu ownership and their relationship with the area, the name of the park was changed from Ayers Rock-Mount Olga to Uluru-Kata Tjuta, its traditional name. Although the Anangu have regained ownership of Uluru-Kata Tjuta National Park, numerous issues, primarily related to the impacts of tourism, continue to undermine their right to preserve their spiritual and cultural heritage. Some 400,000 people visit the park annually, and this high number creates multiple strains on the park. Overcrowding, especially during the peak season, robs the park of its atmosphere of solitude and sacredness. In addition, the introduction of certain species of plants and animals, some of which arrive via park visitors, threaten natural species in this fragile desert ecosystem. Climbing the rock is also dangerous: heat and winds pose a significant threat, and 36 people have died while making the climb since record-keeping began in 1958. Because of the safety issues, in 2008 the decision was made to close the climb after 8 a.m. during the hottest summer months, December through February. Yet despite the multiple discouraging factors, some 38 percent of visitors choose to make the climb. Although Anangu tolerate climbing on Uluru, it is clear that commercial pressures have kept the rock open. In 2001, after the death of an elder, Anangu closed the path for a 10-day mourning period, which elicited protests from some government officials and members of the region’s tourist industry. In September 2009 a tour operator revealed that visitors had been defecating at the top of the rock for years. A new approach to discourage climbers was launched in October 2009, when the park opened a $21 million viewing area called Talinguru Nyakunytjaku, which means “place to look from the sand dune” in Pitjantjatjara. The area includes viewing platforms – offering dramatic panoramic vistas – that are landscaped into the dunes, nearly a mile of walking trails, traditional shade shelters, and interpretation of the Aboriginal landscape and stories. Traditional owners chose the site and were closely involved in every stage of the development. In 2009 – citing respect for Anangu belief along with safety concerns – the park board of management proposed an outright climbing ban in its draft management plan, which caused an uproar in the tourism sector. During a public-comment period on the proposal, the government received 153 submissions, 78 in support of the closure and 75 against. Despite the close numbers, a new management plan was submitted and signed by Environment Minister Peter Garrett in January 2010. A recent study by Parks Australia conducted over three years found that 90 percent of visitors to the park would not be put off by the a climbing closure. The new plan instead allowed for an eventual ban when one of three conditions is met: (1) the number of annual visitors choosing to climb drops to below 20 percent; (2) the park board, in consultation with the tourism industry, determines that adequate new visitor experiences are in place; or (3) the cultural and natural experiences available to visitors are the key reasons they decide to come to Uluru. Garret said he expected the climb to remain open for several years to come. Park management will now focus on adding new visitor experiences, such as nighttime and cultural activities. If and when a ban is ultimately deemed appropriate, the tourism industry will be given at least 18 months notice so it can adjust its marketing. In the meantime, park management will continue to promote the “do not climb” message to visitors. However, despite the number of annual visitors who choose to climb dropping to below 20 percent (as measured by climb counting machines), the management plan has been changed: all three of the above conditions must now be met. In addition, the tourism industry must receive 18 months notice before climbing can be prohibited. Photography is also a very sensitive issue, and visitors are banned from taking photographs in certain areas because of the risk of revealing sacred sites. Because of the location of sacred sites, access to certain parts of the park is also restricted, and the park is closed to all visitors from sunset to sunrise. There are also concerns about the existing tourism infrastructure. For example, the road that surrounds the park runs close to some sacred sites. Yulara, the resort town 12 miles outside the park that accommodates almost all visitors, has been praised by some for its environmental sensitivity – it is built entirely below the level of the highest bordering sand dune – but others criticize it as an overpriced, culturally insensitive sprawl. Furthermore, Anangu have no part in Yulara’s management and expansion decisions. In addition, Anangu are concerned about their opportunities to share in economic benefit from the tourism they permit on the land. They form a majority on the park’s board of management, are employed as rangers and cultural interpreters, receive a share of rent and entry fees and control commercial enterprises within the park, but overall Anangu involvement in commercial uses of the park and its surrounding tourist infrastructure is limited. Their challenge is to make tourism an opportunity for economic sovereignty rather than another manifestation of colonial exploitation. International recognition and national law help to preserve Uluru-Kata Tjuta National Park and its sacred sites. The park is listed as a UNESCO World Heritage site for both its natural and cultural heritage, in recognition that Anangu land management practices, governed by Tjukurpa, have sustained the ecosystems and biodiversity of the area. The park is protected under Australian law by the Environment Protection and Biodiversity Conservation Act 1999. The Northern Territory Aboriginal Sacred Sites Act of 1989, perhaps the only law in the world that explicitly protects indigenous peoples’ sacred lands, provides further safeguards. If you visit Uluru-Kata Tjuta National Park, don’t climb Uluru. Take advantage of the new viewing platforms, walking trails and cultural activities, and familiarize yourself with the park’s guidelines on visitor safety and responsibilities. Please respect the trail signs prohibiting photography in sensitive areas; review the park regulations regarding commercial photography, filming and recording, and apply for the required permit, if necessary. If you want to take part in a guided tour, be sure to use a company endorsed by the traditional owners of the park (information available at the park’s cultural center); avoid any company that advertises climbing Uluru as part of its tour activities. Abitbol, Chantal. 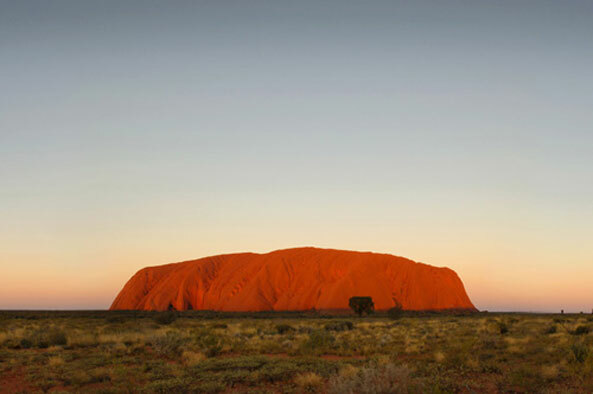 “Uluru: The Debate Over Climbing Australia’s Sacred Monolith.” CNNGo, August 17, 2011. Aboriginal Areas Protection Authority. Aboriginal Areas Protection Authority. Australian Government Department of the Environment, Water, Heritage, and the Arts. “Nganana Tatintja Wiya – ‘We Never Climb’.” Uluru-Kata Tjuta National Park. Australasian Legal Information Institute. “Northern Territory Aboriginal Sites Act.” Australasian Legal Information Institute. Central Land Council. Central Land Council. Chatwin, Bruce. The Songlines. New York, N.Y.: Penguin Books, 1988. Director of National Parks. “Uluru-Kata Tjuta National Park Draft Management Plan – call for public comment.” News release, July 8, 2009. Garrett, Peter (Minister for the Environment, Heritage and the Arts) and Warren Snowdon (Minister for Indigenous Health, Rural and Regional Health). “A New Dawn Rises for Tourism at Uluru.” News release, October 8, 2009. Murdoch, Lindsay. “Sunrise Industry: The New View of Uluru is a Sight Worth Millions.” Sidney Morning Herald, October 8, 2009. Murdoch, Lindsay. “Garret to Allow Uluru Climbs.” Sidney Morning Herald, January 9, 2010. Rabbit-Proof Fence, DVD. Directed by Phillip Noyce. Miramax Home Entertainment, 2003. Toyne, Phillip and Daniel Vachon. Growing Up the Country: The Pitjantjatjara Struggle for Their Land. New York, N.Y.: Penguin Books, 1984. United Nations Educational, Scientific and Cultural Organization. “Uluru-Kata Tjuta National Park.” UNESCO World Heritage Center.